If you’re looking for delicious pizza (for theme park standards) then Disney World is definitely up there. From authentic Italian brick oven pizza from the Italy Pavilion in Epcot all the way to the generic quick service pizza you get at most parks and resorts, you’ll truly be satisfied with the pizza options available to you. 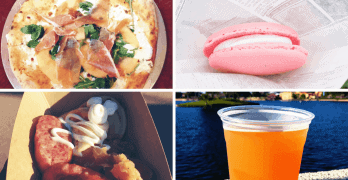 Below, you’ll discover some of the best pizza at Disney World that you should definitely check out the next time you’re craving some fresh pies. Here’s the best pizza that you can get from Walt Disney World. From flatbreads and generic Disney Parks pizza to authentic Italian brick oven pizza, there’s no shortage of tasty pizza at the wonderful world of Disney. I like my pizza spicy so be sure to opt for some spicy Italian sausage. It’s fantastic. Get this from Via Napoli Ristorante e Pizzeria in Epcot. A brick oven pizza topped with prosciutto ham and cantaloupe slices. It may sound unappetizing but it’s a unique and tasty combination. Not going to lie here but I do really like the generic pizza you find at the Disney Resorts and most of the parks. Great crust, super chewy, and delicious. You can find this at Toy Story Pizza Planet, Catalina Eddies in Hollywood Studios and Pizzafari in Animal Kingdom. Plus, the pizza is available at all the Disney Resorts too! If you’re looking for something thinner and lighter than what you’ll find at most quick service restaurants at the parks, then you should opt for a delicious flatbread pizza from Pinocchio Vilage Haus in Magic Kingdom. If so, let me know in the comment section below. SSN when the first job he wol#d&u39;ve needed to obtain a SSN for was at a Baskins Robbins Ice Cream store in Honolulu HI and there's no record of him ever even having been in Connecticut much less lived/worked there.